As only The Onion can, a story reports an FCC study recently found Microsoft's $300 million advertising campaign has been crashing TVs across the nation. 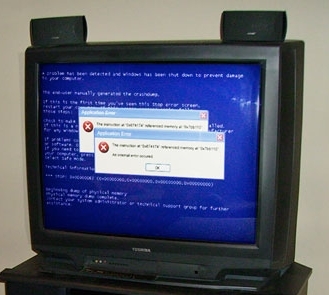 Apparently, millions of people have been experiencing critical errors after the ads have appeared on their television sets and many people report seeing screens turn blue with "terminal application error" appear in a pop up window. "I tried to push the power button, but nothing happened," said Andover, CT resident David Lax, who claimed that his television has never had any compatibility issues with commercials in the past. "Luckily I called my buddy Todd, who's pretty good with televisions, and he told me that you just have to unplug it and plug it back in." If they had had an Apple TV, there would have been no problem. I have a complete Micro$oft-free zone here with a logo to match. Never a crash, never a bug, never a virus. Macs rule!